Pass any farmers market and you are sure to see juicy, red, orange and all different colored ripe tomatoes. Tomatoes are rich in Vitamin C (important for wound healing and can increase iron absorption) and lycopene (an antioxidant that has been shown to reduce prostate cancer). Additionally, lycopene can increase HDL (healthy cholesterol) and reduce LDL (bad cholesterol). Some studies have shown a relationship between lycopene in tomatoes and the reduction of the presence of oxidized LDL, which can contribute to the plaque on the walls of the arteries. Tomatoes and tomato products can be incorporated into a diabetes meal plan. If you are following a consistent carbohydrate diet, though, you may need to count the carbohydrates in tomatoes. For example, 1/2 cup of commercial tomato sauce is about 7 g of carbohydrate and cherry tomatoes are about 1 g of carbohydrate each. The best way to determine if tomatoes affect your blood sugar is to test your sugar two hours after a meal. The American Diabetes Association recommends that blood sugar be <180mg/dL two hours after the start of a meal. If you find that your sugar is above this goal, you can ask your certified diabetes educator if you should adjust your meal or your medicine. Also, think about what you are eating with those tomatoes. If you are topping a large bowl of pasta with sauce, the odds are that the tomatoes aren't affecting your sugar, but the culprit is the pasta. 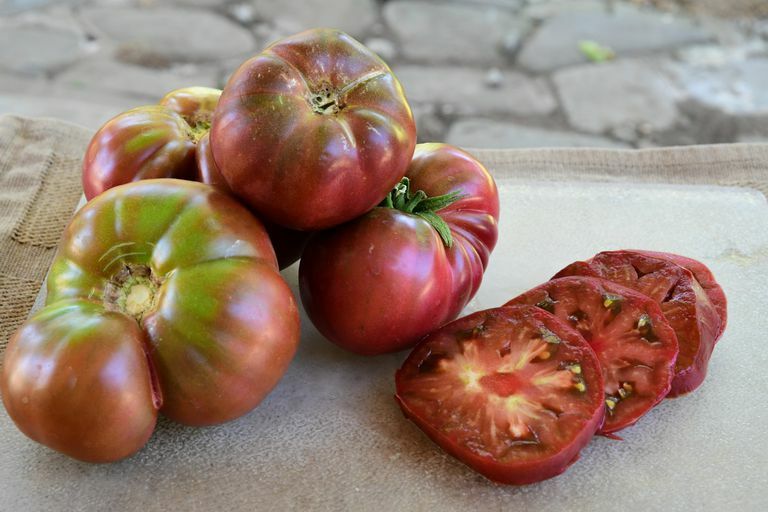 One small sized red ripe tomato (about 2-2/5" diameter)" contains about: 16 calories, .2 g fat, 0 g saturated fat, 3.5 g carbohydrate, 215mg potassium, 3.5 g carbohydrate, 1.1 g fiber, and .8 g protein. Heating: Tomatoes are one of those foods that are more nutrient-dense when they are cooked. Heating tomatoes in a small amount of fat, such as olive oil, increases the bioavailability of lycopene. To keep calories at bay, be conservative with your oil use. Roasting: Roasting yields a juicy, concentrated flavor and texture. Season tomatoes with olive oil, garlic, red pepper, and other herbs and spices - eat plain or use roasted tomatoes to puree for a tomato sauce or as a topper for grilled, baked or roasted meats, chicken or fish. Tomato Sauce: One of life's comfort foods, tomato sauce doesn't have to be used for pasta only. Tomato sauce can be used to flavor roasted vegetables, spaghetti squash or to add texture and flavor to stews, chili, ​and protein. You can season your tomato sauce however you'd like. Tomatoes can be eaten simply too. They are great additions to sandwiches, salads, dips (like guacamole) or dipped in hummus or a low-fat yogurt dip. Do not store fresh tomatoes in the refrigerator, in fact, this can turn the flesh mealy and reduce the flavor. Instead, store in a cool, dry place. Do You Know What Counts as a Carb Exchange?